Hamid Karzai, president of Afghanistan since the 2001 Bonn agreement up until a year ago, never truly had his heart in building state institutions, at least not in the same way his Western partners had in mind. Coming from a tribal background, he was ideologically opposed to a strong state bureaucracy and rekindled tribal patronage at the highest levels of government, a trend that had hardly been seen in Afghanistan for at least a century before him, barring the 1990s Civil War and the ensuing Taliban regime. Turning into a vocal critic of the current president, he continues to wield influence among the tribal communities to challenge the government’s authority. Except for brief disruptions, the process of institutionalizing a modern state continued in Afghanistan during the 20th century, albeit with formidable concessions given to tribal chiefdoms in the South and East in the form of tax releases and exemption from mandatory military service. Although this created pockets of tribal power which never entirely came under Kabul’s control – laying the bedrocks of the current religio-tribal Taliban insurgency – the Afghan court believed in fostering a modern state machinery, particularly under the firebrand Prime Minister Daud Khan between 1953 to 1963. The Afghan constitution of 1964, drafted by foreign-educated experts, even showed signs of limited democracy such as establishing a bicameral legislative branch. The more pronounced institutional reforms came under the fiercely ideological People’s Democratic Party’s regime during the 1980s. In power for more than a decade, the party’s hasty measures to transform the Afghan social fabric in a Soviet fashion backfired tragically, precipitating conservative resistance and an Islamist militancy that continues today. Nevertheless, the party de-facto prime minister for nearly a decade, Ali Kisthmand, was from an ethnic group – the Hazaras – whose members were previously banned from entering University or gaining higher military ranks. The head of state for eight years, Babrak Karmal, was allegedly a Tajik, itself a direct challenge to Pashtun rule in the country. By this time, impersonal politics and freeing bureaucratic selections from tribal considerations had gained relative momentum in the country, more accurately in Kabul, and ethnic prejudices were reduced to personal preferences of government officials rather than being the common state of affairs. However, minimal progresses in institution building was severely affected during the 1990s Civil War and the pursuant Taliban regime, spurring divisions propped up by local patronage systems throughout the country among all the ethnic groups. In the post-Taliban regime excitement, Karzai’s leadership was endorsed by the international community as the safest option. Succeeding his deceased father as the head of the Popalzai tribe, he was a less known militia leader in the South at the time of the Bonn conference, having lived most of his life amidst tribal culture and traditional authority. While leading a small contingent of fighters against the Taliban after falling out with the group who allegedly assassinated his father, he was hand-picked at the Bonn Conference by the Bush administration envoy, Zalmai Khalilzad, as leader of the post-Taliban interim administration despite losing a conference-wide election to an ethnic Uzbek, the royalist Satar Sirat. Contrary to western misunderstandings, Karzai was not leading Afghanistan for more than a decade without a political vision. He more than made up for his reluctance to create a central state bureaucracy in furthering an informal network of tribal clients, privately advanced to bypass the government institutions he himself was heading, but usually suspected were misleading him and were under Western control. His opinion on tribal influence in the Afghan society is better described in an essay he wrote while studying in India, in which he sides with the long-standing policy of respecting tribal role by the Zahir Shah monarchy. Berating the western habits of educated tribal elite who had chosen an urban life at the cost of “isolation from realities of the Afghan society,” he doesn’t shy away from affirming his admiration to the historical place tribes have had in the Afghan society, mainly in the South and East. 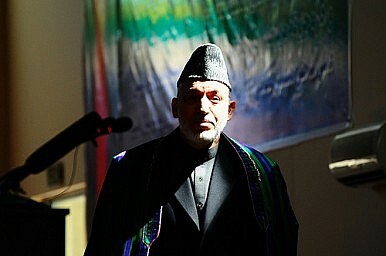 In an interview two weeks after the April presidential elections last year, Karzai shows that his views on tribal matters have changed little since he wrote his essay nearly three decades ago. Criticizing representative democracy as an imperfect Western imposition too reliant on political parties, he derives a cursory analogy between the tribal communities of Afghanistan and the Panchayati Raj system in India, making a case for his back-channel policy of empowering tribal elders during his government in a bid to foster what he considered to be participatory democracy. While there are similarities between the two, the Panchayati Raj in India has never been a patronage-ridden system of tribal loyalties, neither have they been defiant of central authority but are village-level governance structures that have, in fact, become officially part of the Indian government since 1992. This is when Pashtun tribal groups remain strictly bound to their elders and are in most cases impermeable to social and political change, defying central authority as their raison d’ être. Karzai’s analogy between the two cases betrays what was more likely a deep-seated affinity to preserve his tribal ties parallel to holding a legitimate government office. Moreover, it seems that his ideology follows his politics, rather than being the other way around. He came from an environment wrought with tribal relations of power and prestige and chose an ideology – participatory democracy – that would conveniently suit his tribal background in a seemingly modern guise. He even admits to have little relied on government institutions, thereby effectively widening the space for his tribal clients to function freely rather than streamlining government authority through formal institutions and strengthening his weak administration. While serving as the president of the country, he was also bound by the Pashtun code of honor to serve his tribal affiliates after becoming the head of an influential tribe, and so he did by extending a network of tribal clients that continues to buy him legitimacy and political leverage. Feeling the challenge from his predecessor, the current Afghan president Ashraf Ghani is trying hard to broaden his amiability among tribal elders. Rumors abound of Karzai’s intentions to undermine the decisions taken by the Unity Government, particularly the recent steps to mend relations with Pakistan, and Ghani wishes to counter them. He recently appointed 18 new advisers among whom the ones in-charge of tribal affairs seem more prominent. What is at stake in here is the course of institution building in the country which can be further derailed by periodic meddling of Karzai, shifting the attention to building informal political influence rather than the crippling state machinery. Although Ashraf Ghani is often charged with ethnic bias himself, appointing mostly from his Pashtun tribesmen and having previously shown strong opinion about the Mujahideen who are seen as representative of other ethnic groups, mainly Tajiks. But his core loyalty lies with his Western education that can be clearly seen in his emphasis on institution building in his program of action during his election campaign. Additionally, Abdullah Abdullah, the chief executive of the Unity Government, seeks his power base among non-tribal sections of the population and considers too much tribalism a political threat. Absent Karzai’s interference, the leaders of the Unity Government might succeed in laying down the foundation of a modern bureaucracy in Afghanistan, perhaps for the first time in three decades. Kambaiz Rafi is a political economy analyst and researcher. He writes on issues ranging from political economy to Human Rights, democratisation and political Islam. He has a Master of international political economy from King’s College London. Statebuilding in Afghanistan has always been about building a strong center. It has failed.